Ranting Panda: African 'Gangs' of Melbourne - crisis or media beat-up and politically expedient tool for conservatives? 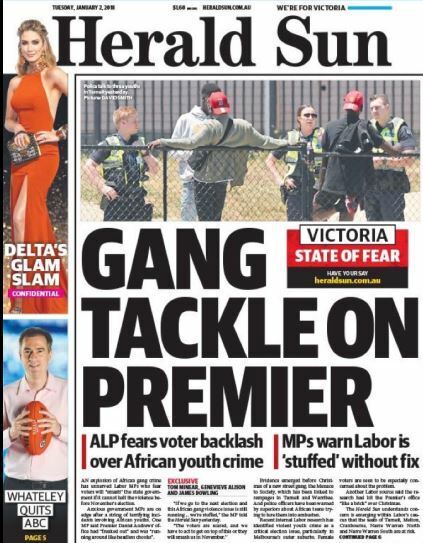 African 'Gangs' of Melbourne - crisis or media beat-up and politically expedient tool for conservatives? The Liberal Party of modern times, has shown that it has no capacity for debate, only for division. James Buchanan, 15th President of the US, stated, 'The test of leadership is not to put greatness into humanity, but to elicit it, for the greatness is already there'. The federal Liberal Party has not been eliciting greatness from Australians, but dog-whistling to elicit fear and hated. Their latest target has been so-called 'African gangs' allegedly running amok in Melbourne. The issue with these 'gangs' kicked off a few years ago when a group of people who supposedly called themselves 'The Apex Gang' rained havoc on the streets of Melbourne through car-jackings, home invasions, assaults and robberies. One of their most notorious escapades was when a large number of them descended on the Moomba festival in March 2016 and attacked innocent festival-goers. It made for sensational headlines and the media went on a feeding-frenzy, whipping up hysteria within the community. The media reported this 'gang' as being African, which caused all sorts of issues with racial profiling and stereotyping. The police were reluctant to call them a gang, which greatly upset a lot of people who felt the cops were being 'politically correct'. However, there were two things the police pointed out. One was that gangs are organised and comprised the same people meeting regularly, whereas this was a loose collection of young people who occasionally hung out together with no regularity in attendees. They did commit crimes, but it wasn't the organised style of activity that police are used to seeing with 'gangs', such as Outlaw Motorcycle Gangs. Of course, 'gangs' helps to generate more fear among the population than if they are referred to as a 'loose collection of young people connected on social media'. Additionally, they were not all Sudanese, even though this was how it was reported. The police issued numerous corrections stating that Apex was comprised of Anglo-Saxons, Maoris, Pacific Islanders, Afghans and Sudanese(1). Yet, the public bays for blood and wants to know why the government isn't deporting these young criminals. That is probably because most of the so-called Apex 'gang' were Australian-born, which contradicted the popular narrative in the media. The Police Commissioner went on to state that 'young people born overseas were less likely to commit crimes'.(2). Nonetheless, at least four have been subject to deportation proceedings(3). It is pertinent to note that three of the four are from New Zealand and one is from Sudan. The stereotyping of Africans as being criminals or gang members is counter-productive. It encourages racist taunts and attacks, which mean that many in the Sudanese community need to stay close together for their own protection. This garners even more negative attention from those fear-ridden people who are manipulated by headlines to fear groups of Sudanese(4). The danger with this stereotyping and dog-whistling is that police are pressured into addressing crime within the South Sudanese community, while crime by other groups is not responded to as quickly. For instance, in December 2017, a group of about 60 African youths rioted at a McDonald's restaurant in St Kilda, before attacking people in and around the restaurant(5). Obviously a bad situation, very anti-social and people have a right to be upset about it and demand justice. However, just a few weeks after that, more than 100 white people rioted in the Victorian town of Torquay. It barely rated a mention in the paper, and the rioters were described as a 'group' rather than a 'gang'(6) ... (hmm, who's being politically correct now?). Since then, the Murdoch papers have been reporting every infraction by Africans and seemingly ignoring crimes committed by white Aussies, even though white Aussies commit the vast majority of crimes in Melbourne. It has become a political issue ... not for community safety, but for political points scoring. The federal Liberal Party has been attacking Victoria's Labor government under Premier Daniel Andrews, blaming them for the problem, even though the Andrews government has committed $2 billion to hiring 3,000 new police officers, $288 million for a high security youth detention centre, and breached human rights laws by housing children in adult prisons(6). Hardly an example of a 'soft-on-crime' government. But then, the federal Liberal Party has been breaching international laws on human rights, refugees, children and torture for years by indefinitely detaining asylum seekers and refugees in inhumane off-shore detention facilities ... oh and subjecting them to torture and human rights abuses(7). Perhaps that is what the Liberal Party is expecting of the Andrews government ... to torture African youths. While complaining about Labor being soft on crime, the previous Liberal Party led Victorian government had slashed more than $100 million from the police budget and reduced police numbers by 400(8). As is often the case in Australian politics, the Liberal Party budget cuts impact essential services and exacerbate social issues, including crime, leaving the next Labor government to increase spending to rectify the damage the Liberal Party caused. Victoria's Police Commissioner ripped into the federal government and sections of the media for misrepresenting the issue of 'African gangs'(9). One of the so-called 'African gang' incidents that the media went apoplectic over was an affray at Tarneit Central Shopping Centre in which African youths got into a scuffle with Police and journalists. However, Police later discovered that the incident did not involve a gang, nor did it involve African youths going on a violent rampage. What they did discover was that the incident had been provoked by the aggressive behaviour of a journalist who saw some African youths just sitting around behaving themselves. This mental giant decided that because they were African, they must be trouble-makers and went over to take photos of these kids simply because they were African. Not surprisingly, the young fellas got a little upset about this and things went pear-shaped from there. The photographer later apologised and acknowledged his behaviour caused the incident, however, his employer, The Daily Mail, did not mention this but instead reported how the youths abused their reporter. The police sent a terse email to a number of media outlets warning them against such behaviour and to not inflame situations(10). On 11 January 2018, a South Sudanese family living in Brisbane was followed home, racially abused and threatened by an enraged white Australian man who for some inexplicable reason then invoked the names of a number of Outlaw Motorcycle Gangs. The victim of the attack posted videos of it to Facebook and placed the blame for the attack on Prime Minister Malcolm Turnbull and Home Affairs Minister, Peter Dutton, for creating division and racism. (11) The government's racist rhetoric normalises hate speech and empowers aggressive, violent behaviour by people who have a warped sense of patriotism. But their idea of patriotism equates to white supremacy and fascist control over all who disagree or are different. The government should be condemning racism, but instead thrives on it. It should be condemning nationalism and fascism, yet these are the tools it uses to spread fear and hatred so it can portray itself as society's saviour, riding in like a shining knight on a white horse draped in flags of white supremacy. The issue has escalated to a point where it is becoming very dangerous for anyone who appears to be Muslim or from Africa. Concerns about innocent people being attacked by African 'gangs' are understandable given the sensationalist reporting by the media and dog-whistling by unscrupulous politicians. However, what about attacks on innocent Africans? There have been calls for vigilantes to do what the police can't. This in itself is disturbing because the police are taking action and vigilantes will just make it more difficult for them to do their job. Vigilantes will be adding to the crimes that police need to investigate, making things worse, not better. Far Right groups are threatening to 'take a stand' against the African gang crisis(12). Dutton, Turnbull and sensationalist media coverage are empowering racism and hate crimes. Channel 7 was heavily criticised for reporting on a far-right meeting about taking action against the 'immigrant crime crisis'. 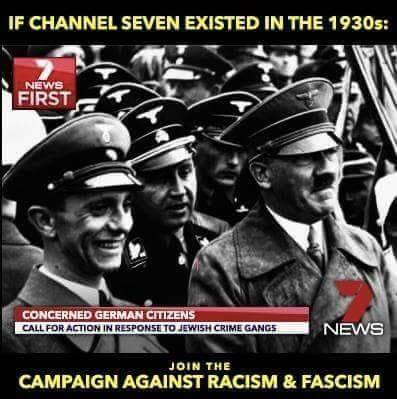 Channel 7's story was sympathetic to the views of the far-right group, rather than challenging the groups' intentions to target immigrants who are already persecuted and discriminated against(13). Victoria Police has reported an increase in death threats against African-Australians(14). Yes, those who commit crimes should answer to the law, whether they are from South Sudan, Australia, New Zealand or anywhere else. However, if people genuinely want to address youth crime, then we need to acknowledge and address the cause of the problem rather than only react to the symptom. Following Apex's rampage through Moomba, a Victoria Police summit to get to the root of the problem identified that disengagement, disadvantage and 'feeling locked out of society', were key contributors(2). Disengagement and 'feeling locked out of society'. The blatant racism, stereotyping, demonising and victimisation of refugees and asylum seekers, along with disgraceful attacks against Islam, are THE reasons why many refugees feel 'locked out of society'; why many feel a disengagement. The right-wing state that many of these refugees can't assimilate, yet the right-wing does not give them a chance to. The right-wingers do not want refugees to assimilate because they do not want them here. It is the right-wing who is refusing to assimilate. They are more than happy to embrace messages of hate and fear if that matches their own racist views. Interestingly, the Islamophobia that is promoted by everyone from neo-Nazis to pentecostal preachers is often used to tar all refugees and asylum seekers, yet most refugees from South Sudan are Christian(15). It is easy for the federal government to dog-whistle and blame Victoria's Labor government, however, part of the issue can be firmly blamed on the government of Tony Abbott, which banned many refugees from working or undertaking educational programs, while constantly referring to them as illegals and whipping up fear and hatred against them. Additionally, the federal government has defunded employment and training programs for young people, which is a contributor to the disadvantage that the police summit identified. Gee, what could possibly go wrong. The federal government has taken a scatter-gun approach about who to blame for the so-called 'African gang crisis'. They are also blaming the judiciary for being full of civil libertarians who are 'soft on sentencing'. Not surprisingly, the judiciary hasn't appreciated this attack on them by a government that is doing its best to sow division, fear and hatred in the community for the sake of maintaining its political power. The Law Council has criticised the federal government, pointing out that these attacks undermine the rule of law and threaten the independence of the judiciary(16). Facts haven't factored into the federal government's dog-whistling, even though the Police have pointed out numerous times that youth crime has reduced over the last few quarters. By comparison to other states, Victoria's youth crime is quite low, with the Australian Bureau of Statistics reporting that in 2015/16, Queensland had 12,931 youth offenders, New South Wales had 20,051 and Victoria languished at 8,726(17). South Sudanese comprise 0.14% of Victoria's population, with 1.5% of criminal offenders being Sudanese, indicating that they are over-represented in crimes. In relation to charges of riot and affray, Sudanese contributed 6%, while people born in Australia comprised 71.5% and 5.2% were born in New Zealand(18). Fiona Dowley, chief statistician from Victoria's Crime Statistics Agency, explained that these figures include people who have been linked to crimes, but who 'may not have been through a court process, they have not been found guilty of anything, and they may not even have been charged'(19). Clearly, there are crimes being committed by some from the South Sudanese community, but they are not the majority of criminals. There is a school of thought that the 'gang crisis' is the creation of the Herald-Sun. This wouldn't be the first time that a media outlet has created a gang crisis. In Adelaide a few years ago, media coined the term 'Gang of 49' in relation to a number of indigenous people who were committing crimes. They weren't a gang at all(20). Yes, they were committing crimes ... but, gang? Why? Again it helps to promote racism and fear if the community can be convinced that they are under attack by an organised syndicate of people who are somehow different to them. Similarly, the Apex 'gang' was hardly that ... until the Herald Sun ran with it. The upshot was that what started as a loosely aligned group of about 200 young people, mushroomed to 400 through the notoriety that Apex gained from the sensationalist coverage in the media(21). The dog-whistling and sensationalism is not helping the issue. It is pressuring police in such a way as to potentially cause police resources to be redirected from other areas to focus on a small community. It has resulted in police racially profiling Africans even though people born in Australia are responsible for most car-jackings, home invasions and aggravated robberies(22). Some media outlets and the federal government are thriving on community division ... all because some media outlets want to sell papers and undermine the Labor government, while conservative politicians profit from racism and fear in order to undermine Labor. Rather than help the poor and persecuted, conservatives exacerbate poverty and persecute the persecuted. Rather than do what's best for the country, conservatives do what's best for themselves. Rather than allay fear, conservatives thrive on it. Rather than condemn racism, conservatives revel in it. Rather than build community, conservatives divide it. African 'gangs' are not the biggest problem facing Australia; the rise of ultra-conservative nationalism and the normalisation of hate speech and hate crime is. 1. The Age, Nino Bucci, Has Apex gang been mortally wounded?, 21 February 2017, http://www.theage.com.au/victoria/has-the-apex-gang-been-mortally-wounded-20170220-gugziq.html. Accessed 13 January 2018. 2. The Sydney Morning Herald, Michael Koziol, Apex gang: most youth crimes committed by Australian-born offenders, police say, 12 April 2017. http://www.smh.com.au/federal-politics/political-news/apex-gang-most-youth-crimes-committed-by-australianborn-police-say-20170412-gvj964.html. Accessed 13 January 2018. 3. Business Insider, Sarah Kimmorley, Australia is deporting members of Melbourne's Apex gang, 19 January 2017. https://www.businessinsider.com.au/australia-is-deporting-members-of-melbournes-apex-gang-2017-1. Accessed 13 January 2018. 4. The Guardian, Calla Wahlquist, 'We're not a gang': the unfair stereotyping of African-Australians, 6 January 2018, https://www.theguardian.com/australia-news/2018/jan/06/were-not-a-gang-the-pain-of-being-african-australian. Accessed 13 January 2018. 5. The Weekend Australian, Olivia Caisley, Wild gang brawl sees teens bashed by African gang in St Kilda, 15 December 2017, http://www.theaustralian.com.au/news/nation/wild-gang-brawl-sees-teens-bashed-by-african-gang-in-st-kilda/news-story/dcaa764ff97fbb7ad1b752ca46d9dd22. Accessed 13 January 2018. 6. The Guardian, Calla Wahlquist, Victoria's 'gang crisis' and how the election creates a double standard on crime, 9 January 2018, https://www.theguardian.com/australia-news/2018/jan/09/victorias-gang-crisis-and-how-the-election-fuels-a-double-standard-on. Accessed 13 January 2018. 7. The Guardian, Ben Doherty and Daniel Hurst, UN accuses Australia of systematically violating torture convention, 10 March 2015, https://www.theguardian.com/australia-news/2015/mar/09/un-reports-australias-immigration-detention-breaches-torture-convention. Accessed 14 January 2018. The full report can be found here: United Nations Human Rights Council, Twenty-Eights Session, Report of the Special Rapporteur on torture and other cruel, inhuman or degrading treatment or punishment, Juan E Mendez, https://static.guim.co.uk/ni/1425873116713/Mendez-report.pdf. 8. Herald Sun, Peter Mickelburough, More police staff to be made redundant despite crime being on the rise, 13 June 2013, http://www.heraldsun.com.au/news/law-order/more-police-staff-to-be-made-redundant-despite-crime-being-on-the-rise/news-story/424fae31f76b2db7259a839728a9352f. Accessed 13 January 2018. 9. Junkee, Osman Faruqi, Victoria's Top Cop Has Ripped Into Peter Dutton's Comments Over "African Gangs", 10 January 2018, http://junkee.com/police-commissioner-african-gangs/141999. Accessed 13 January 2018. 10. The Guardian, Margaret Simons, Melbourne police say Daily Mail provoked African 'gang flare-up' scuffle, 11 January 2018, https://www.theguardian.com/media/2018/jan/11/victoria-police-say-daily-mail-provoked-african-gang-flare-up-scuffle. Accessed 13 January 2018. 11. 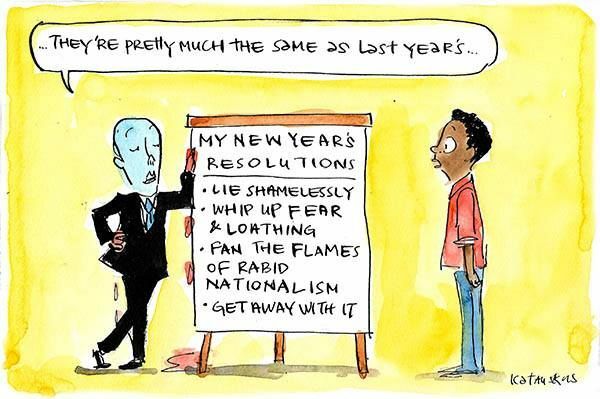 The Guardian, Christopher Knaus, South Sudanese-Australian man blames Turnbull and Dutton for 'racial attack' on family, 12 January 2018, https://www.theguardian.com/australia-news/2018/jan/12/south-sudanese-australian-man-blames-turnbull-and-dutton-for-racial-attack-on-family. Accessed 13 January 2018. 12. 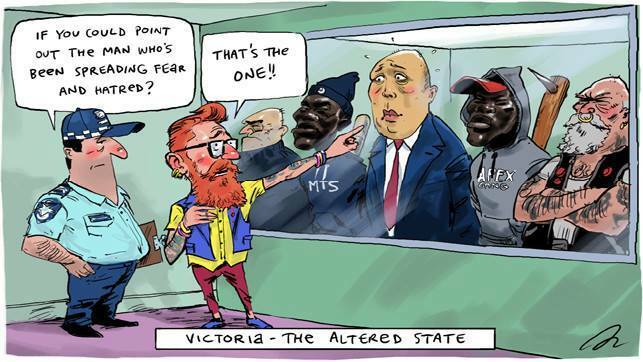 The Age, Liam Mannix, Far Right group threatens to take a stand over 'African gangs', 12 January 2018, http://www.theage.com.au/victoria/far-right-group-threatens-to-take-a-stand-over-african-gangs-20180112-h0hcha.html. Accessed 13 January 2018. 13. The Guardian, Melissa Davey, Channel Seven under fire over interview with far-right activist, 15 January 2018, https://www.theguardian.com/australia-news/2018/jan/15/channel-seven-under-fire-interview-far-right-activist-blair-cottrell. Accessed 15 January 2018. 14. The Age, Nino Bucci, 'How long since you've been out for dinner? ': Police chief rubbishes 'gang crisis', 11 January 2018, http://www.theage.com.au/victoria/how-long-since-youve-been-out-for-dinner-police-chief-rubbishes-gang-crisis-20180110-h0gcn9.html. Accessed 13 January 2018. 15. Australian Government, Department of Social Services, Sudanese Community Profile, 2007, https://www.dss.gov.au/sites/default/files/documents/11_2013/community-profile-sudan.pdf. Accessed 13 January 2018. 16. The Guardian, Paul Karp, Legal body says rule of law threatened after Dutton's criticism of judiciary, 15 January 2018, https://www.theguardian.com/australia-news/2018/jan/15/legal-body-says-rule-of-law-threatened-after-duttons-criticism-of-judiciary. Accessed 15 January 2018. 17. SBS News, AAP - SBS, Victoria Police, African leaders talk gang crime, 12 January 2018, https://www.sbs.com.au/news/victoria-police-african-leaders-talk-gang-crime. Accessed 13 January 2018. 18. The Guardian, Calla Wahlquist, Is Melbourne in the grip of African crime gangs? The facts behind the lurid headlines, 3 January 2018, https://www.theguardian.com/australia-news/2018/jan/03/is-melbourne-in-the-grip-of-african-gangs-the-facts-behind-the-lurid-headlines. Accessed 13 January 2018. 19. The Guardian, Calla Wahlquist, #AfricanGangs: social media responds to Melbourne's 'crisis', 10 January 2018, https://www.theguardian.com/media/2018/jan/10/africangangs-social-media-responds-to-melbournes-crisis. Accessed 13 January 2018. 20. Adelaide Now, Bryan Littlely, Special Report - Inside SA's violent street gangs, 9 April 2010, http://www.adelaidenow.com.au/news/south-australia/inside-the-gang-of-49/news-story/6f81664dda17ce10f20b63f1a6dc8608. Accessed 13 January 2018. 21. Crikey, Emily Watkins and Kanika Sood, Did the Herald Sun invent the Sudanese youth Apex gang?, 21 April 2017, https://www.crikey.com.au/2017/04/21/did-the-herald-sun-invent-the-sudanese-youth-apex-gang/. Accessed 13 January 2018. 22. The Age, Tammy Mills and Bianca Hall, Apex fears spark concerns about racial profiling, 8 January 2017, http://www.theage.com.au/victoria/apex-fears-spark-concerns-about-racial-profiling-20161122-gsvete.html. Accessed 13 January 2018.